Inciting sectarian strife against Egypt's Coptic Christians is not a novelty. Islamist propaganda targeting the Coptic Church, businesses and doctrine thrived for decades and often led to violence and prosecution. Earlier this month, a young Islamist killed a Coptic priest in the streets of Cairo. A new incitement campaign was launched against Copts last year, but what is surprising is that it originates from a cozy home in a peaceful New Jersey suburb. Ayat Oraby is an Egyptian Muslim immigrant, wife, and mother of two children. Her YouTube channel and blog are dedicated to attacking the Egyptian government and other Arab leaders who do not support Islamists. She uses precious free speech rights that she sought in a country like the USA to spew hatred and violence towards others. Generally, Islamists such as Oraby do not believe in freedom of speech except as a tool in western countries to provoke hatred, propagate Jihadist rhetoric, and fantasize about their Islamist utopia i.e. Sharia ruled caliphate. "The idea of ​​the Islamic caliphate," she wrote in a September Facebook post, "is not a political rhetoric but a future that we believe in and a revelation by Allah to his Prophet." Before the January 2011 Egyptian revolution that ousted former President Hosni Mubarak, Oraby was unknown in Egypt and the United States. She introduced herself as a purported freedom activist who opposed Mubarak and allegedly carried liberal views. She promoted many Egyptian youth demands for freedom and democracy through her Vlog and other social media outlets. Oraby kept her support for the Muslim Brotherhood hidden and worked as a news anchor for Egyptian television before 2011. 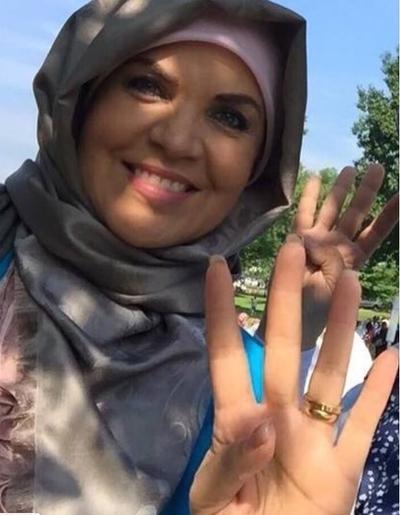 She moved to the United States in 1993 and married Ahmed Ibrahim El-Naggar, an Egyptian-American biochemist who is reportedly affiliated with the Muslim Brotherhood, according to her brother Abdel-Qader Oraby, who also denounced her actions on an Egyptian TV network in 2014. "I don't watch her videos and I don't follow her news because I am very sad from what she says," he said. "The entire family severed ties with her because of her views." She has become one of the most outspoken Brotherhood activists in the United States, with a growing social media following. She also started wearing a hijab to appease Islamists who previously condemned her for posting videos without the Islamic attire. She incites violence and discrimination against Egypt's Christians and calls for denying them equal rights to Muslims, including a limit on church construction. She publicly insulted Coptic Pope Tawadoros II by calling him a "puppy" of Egyptian President Abdel Fattah al-Sisi. "The problem of the Christians in Egypt is that they follow the church gang," she wrote. "They believe that (Coptic Pope) Tawadoros the criminal, or any other criminal who will replace him, was selected by the Lord and speaks on His behalf. The church gang deceives its followers in this despicable way, just like a thief or a swindler from the Middle Ages." She revels in labeling them as "Nazarenes," the Quranic term for addressing Christians. It is considered offensive because it refers to an old Christian sect and it is unrelated to modern Christianity. She believes that Christians wield too much power in Egypt. In one of her YouTube videos, she urges her followers to boycott Egyptian Christian businesses and events. She created the "Campaign to Boycott the Nazarenes" with a slogan: "Buy from Houda (A Muslim Nickname) and snub Shenouda (A Coptic Christian name)." "You (Christians) supported the criminals of the Church and their efforts in killing Muslims. You came to revolt against the elected Muslim president (Mohammed Morsi) and you stood in the face of the will of the Muslims," her introduction to the boycott campaign said. "O Muslims, boycott them (Copts) and do not buy their products force them to understand the consequences of their actions. To understand that their Cross will not prevail over Egypt and that Islam is above all, whether they like it or not." She also frequently promotes a conspiracy theory about dividing Egypt and creating a Coptic state with al-Sisi's help. She claims the Egyptian president is an Israeli Mossad agent, and she calls upon every Muslim end to this "Zionist-Nazarene" plan. The Coptic Church, she claims, illegally annexed lands next to its monasteries in Western Egypt to build a Coptic compound which will be the cornerstone of a Coptic only city. "This church constitutes a gang," she said, "striving to establish a Coptic mini-state. It has shared common interests with the military for a long time." Oraby quotes modern Islamic imams to condemn Christians and Jews. For example, she posted a quote on her Facebook page from the popular late Egyptian Sheikh Mohamed Al-Shaarawi: "We have to seek refuge in Allah from appeasing of the Jews and the Christians, and anyone the Jews and the Christians are content with him must know that he betrayed his religion. We need to differentiate between contentment and coexistence (with them)." She also frequently quotes Islamic scholar Mohammed Al-Ghazali: "The demise of Israel must be preceded by the demise of Arab regimes that have thrived on mocking their people, and the destruction of Arab societies that have adopted illusion and weakness (instead of Islam)." In Oraby's eyes, anyone who opposes the Muslim Brotherhood is labeled an apostate or an infidel. She calls the late Egyptian President Gamal Abdel-Nasser a kafir [unbeliever] for executing Sayyid Qutb, the jihadist scholar and Brotherhood ideologue, and for refusing to upheld Sharia laws in Egypt. She also called Nasser's successor Anwar Sadat a traitor who worked for the CIA and a kafir for signing a peace treaty with Israel. Most jihadists in the world regard Qutb as the ultimate scholar to follow. Qutb's writings on Islamic Fiqh (jurisprudence) became the handbook of every jihadist from al-Qaida's Osama bin Laden to ISIS's Abu Bakr Al-Baghdadi. Qutb denounced the United States after living there for a few years as a decadent and immoral society. Yet Oraby refers to Qutb as the "martyr" and a great scholar whose teachings supersede any other. She advises her audience to teach their children Qutb's books and biography. Known for her abusive and foul language, she gloats over the deaths of Egyptian officers fighting terrorism in Egypt and she celebrates them with her followers. "Forty Egyptian police officer got hammered, may God increase it and bless it," she wrote. Even dead Egyptian actors and artists get smeared, such as beloved Egyptian actor Mamdouh Abdel Aleem. Aleem opposed former Egyptian President and Muslim Brotherhood member Mohamed Morsi. "It is not gloating, but we should all be happy that the "licentious slave" actor is dead," she wrote in a January 2016 Facebook post. She also celebrated the death of a former Egyptian television colleague who also had criticized Morsi. "The demise of the mercenary Fatma Al-Najdi who condemned Rabaa protests and saluted the Misraeli Army," she wrote. "Misr" is Arabic for Egypt. Oraby calls the Egyptian Army "Misraeli" for holding peace with Israel. In May, she joined a Muslim Brotherhood delegation that visited the U.S. Congress to lobby against designating the Brotherhood as a terrorist organization. The delegation included members of Egyptian Americans for Freedom and Justice (EAFJ), which has sponsored events featuring calls for Egyptian leader Abdel Fattah al-Sisi's beheading by Egyptian mujahideen. The delegation included senior officials from New Jersey's Islamic Center of Passaic County. Center Imam Mohammed Qatanani remains subject to deportation proceedings due to his connections to Hamas. Oraby joined other U.S. based Islamists in mourning former Muslim Brotherhood General Guide Mahdi Akef's death last month. "To hell with Egypt, its flag, its army and their institutions, to hell with Egypt a million times," she wrote in a Twitter post. As with most Islamists, the national borders of their home countries don't matter in the grand scheme for establishing a global Islamic state, or caliph. They do not believe in political borders, but in borders based on the faith. Oraby is a staunch advocate for the return of Islamic caliphate and mentions it repeatedly in her articles. She even wrote a poem about it with a map of Iberian Peninsula, showing Islamic Spain factions while lamenting its demise. Ayat Oraby's radical rants and conspiracy theories are nothing new, but her style and reach attract many young Islamist followers. With more than 600,000 Facebook followers, she should not be taken lightly by any security apparatus.